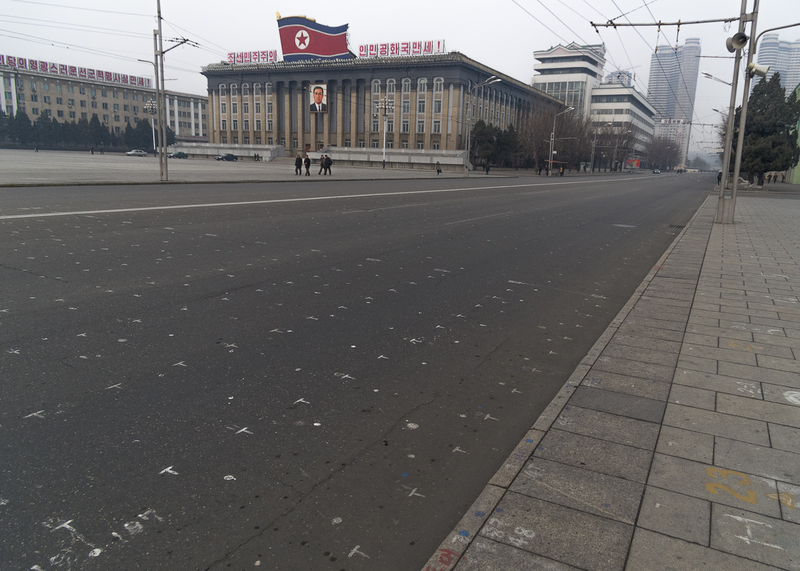 In Feburary I returned to North Korea. 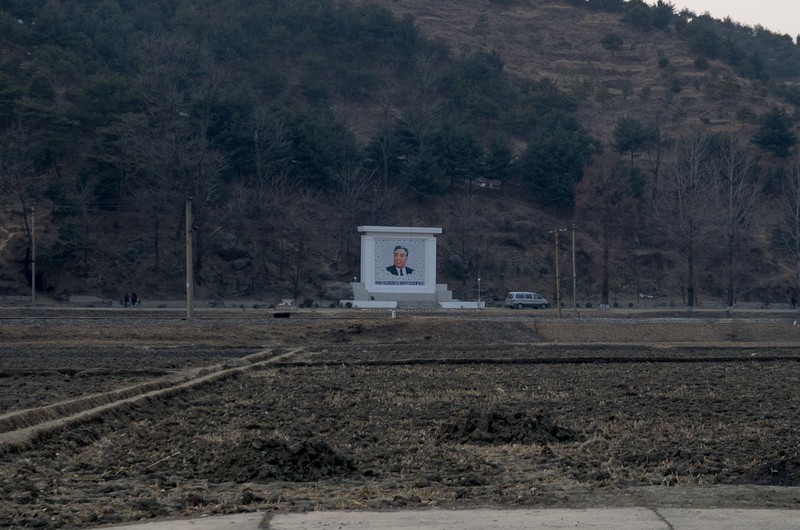 Kim Jong-il had just died and his youngest son, Kim Jong-un, had taken power. 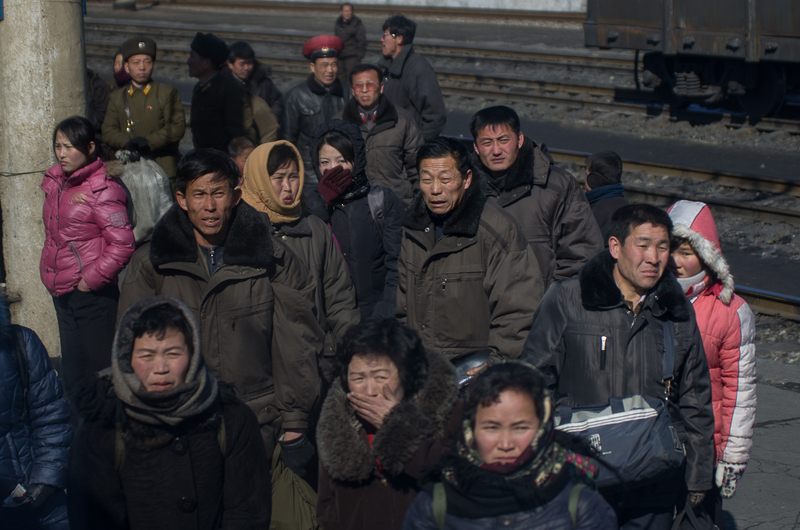 Koreans where still in their 100 days of mourning and Kim Jong-ils birthday was coming. Definitely an interesting time to visit. Visiting in Feburary was also interesting, as the weather was quite cold. 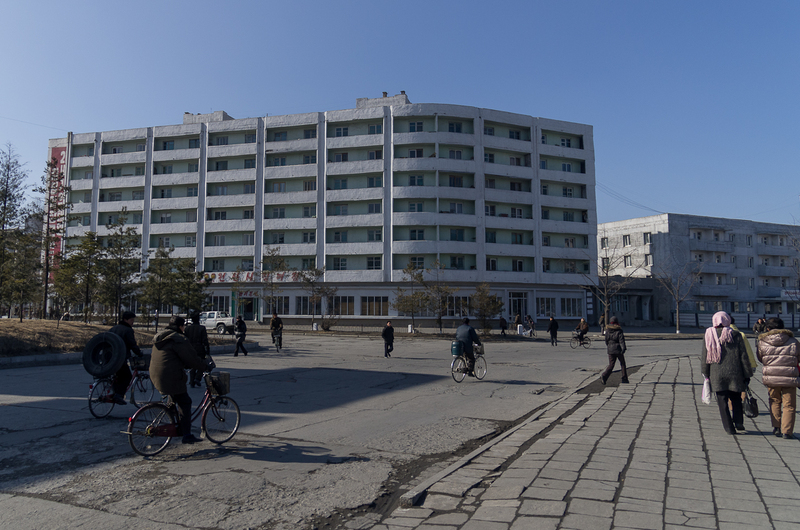 Pyongyang seemed to have power all the time, but outside the city the power was out quite often and hot water was scheduled for an hour in the morning at the hotels. It definitely made for some chilly dinners. Quite the contast from my previous trip in September when the climate much more mild and no power outages. 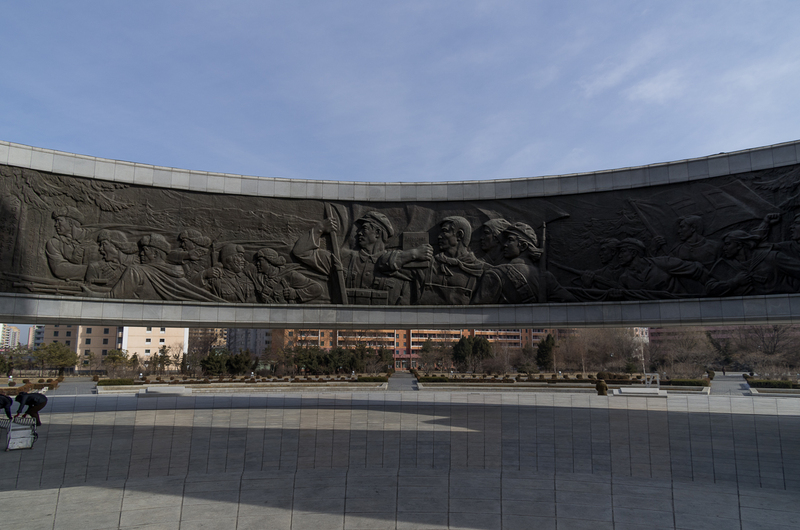 1 Interior of the Monument to the Founding of the North Korean Workers' Party. The exterior looks like this. 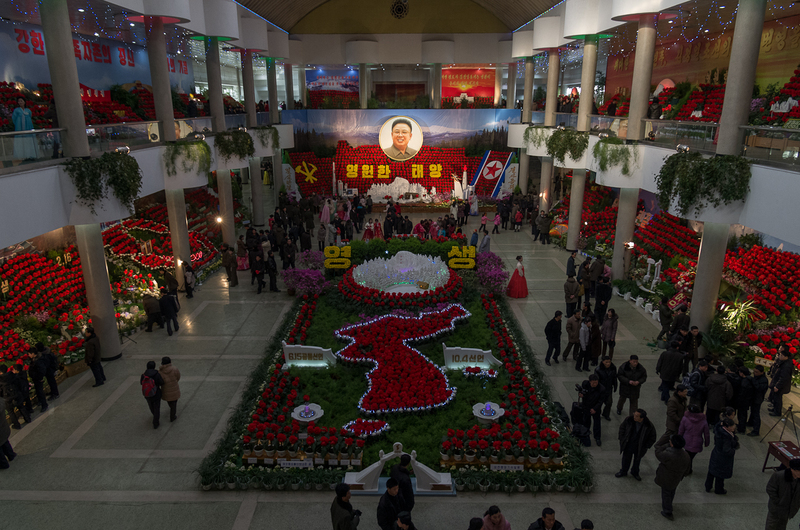 3 The Kimjongilia flower exhibition is an annual event every Feburary. Various state departments grow the flowers to present at this event. The Kimjongilia was cultivated by Japanese botanist Kamo Mototeru and was presented as a "token of friendship between Korea and Japan". 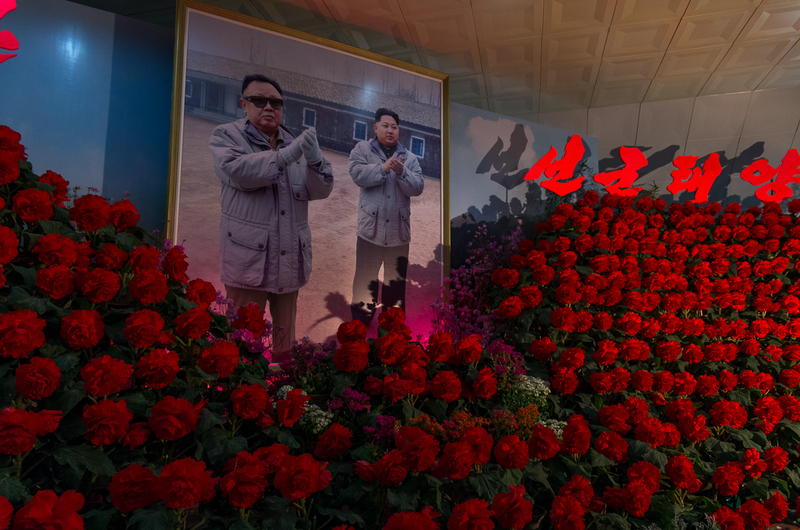 2 Portrait of Kim Jong-il and his son Kim Jong-un at the Kim Jongilia flower exhibition. During my first trip in September 2011 Kim Jong-un was never brought up by the guides unless I brought him up. Things where different in Feburary 2012. 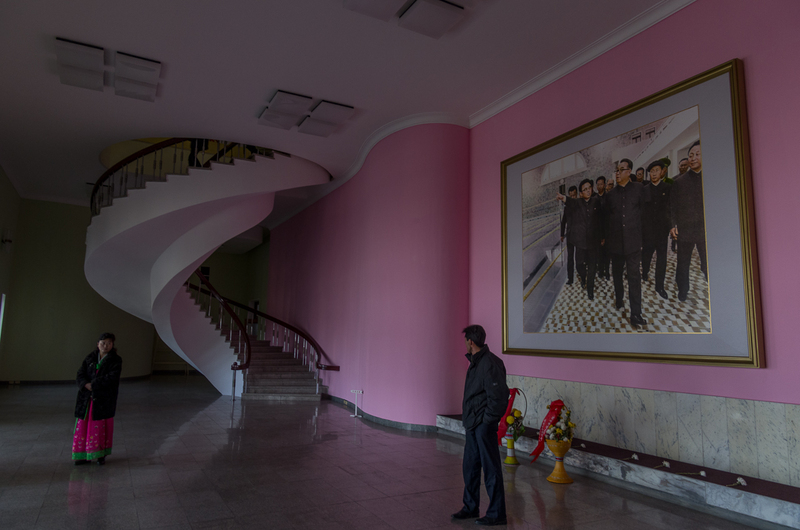 4 North Korean citizens bow to a portrait of Kim Jong-il on his birthday at Pyongyang Indoor Stadium. He had passed away 2 months earlier. 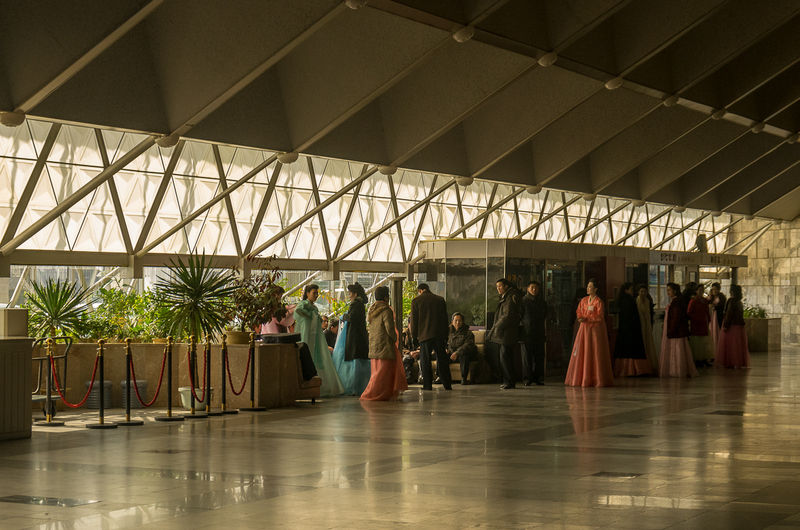 5 Foyer at the Changwang Health Complex in Pyongyang. The pool and bath house is popular and is how many man locals bathe. Even families that have access to hot water like to come here. 6 We left Pyongyang to Hyangsan to visit the International Friendship Exhibition. At Chongchon Hotel we experienced our first problems with power. Our breath was visible in the cold while the waitresses were still serving us in their skirt uniforms. 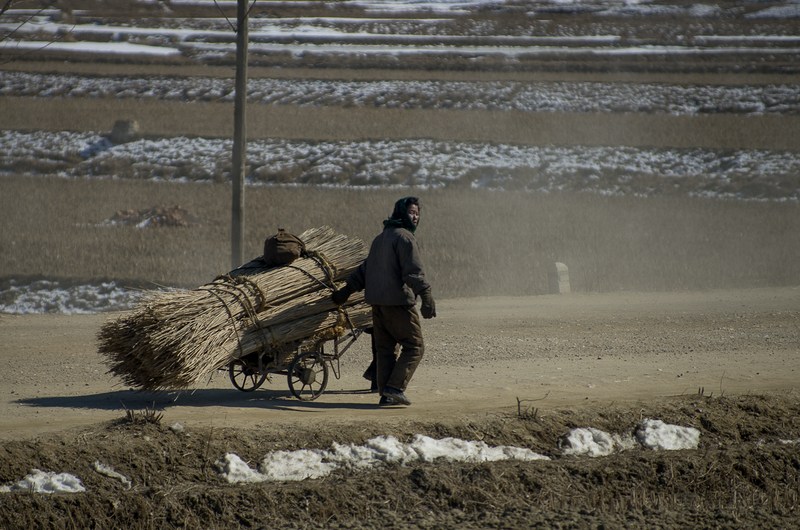 Electricity is a major issue in North Korea, especially in the winter. 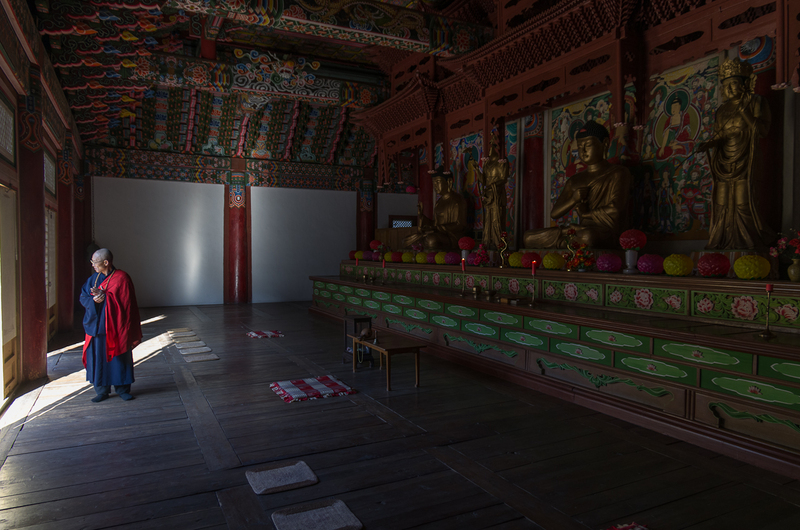 7 A Bhuddist monk at a temple in Hyangsan. 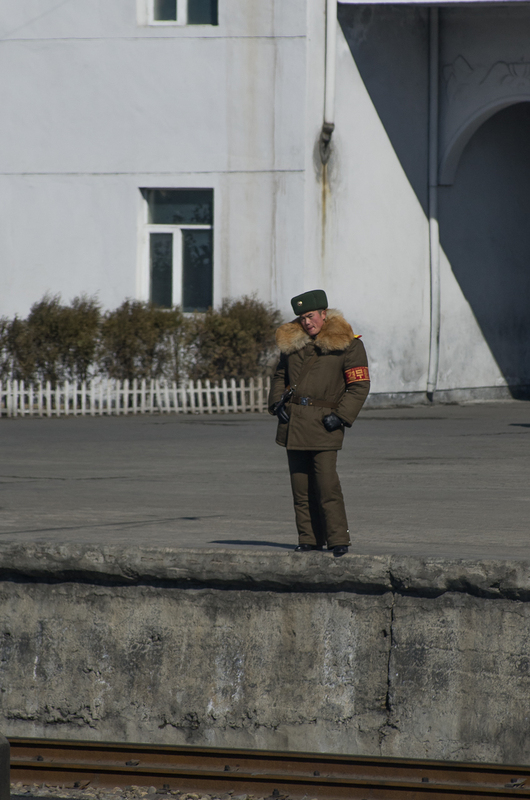 This man certainly lives a unique life as freedom of religion doesn't really exist in North Korea. The temperature was about -10c (14f) here. 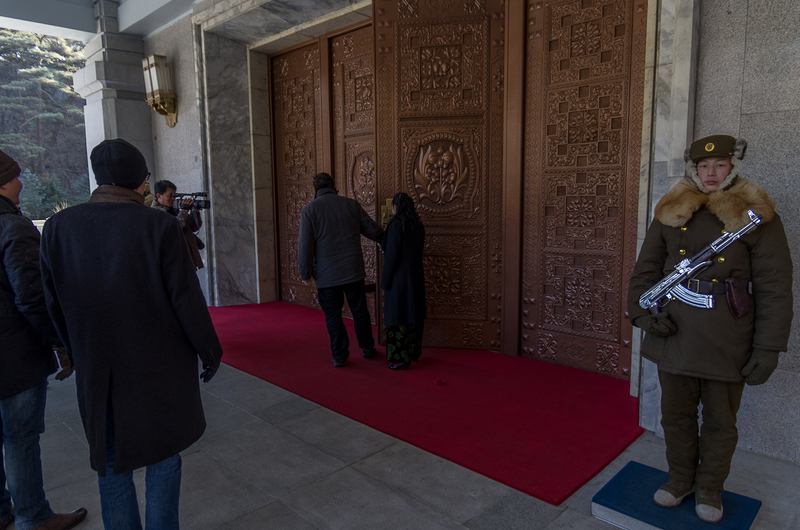 8 A tourist tests out a metal door as a soldier stands guard at the International Friendship Exhibition, north of Pyongyang. 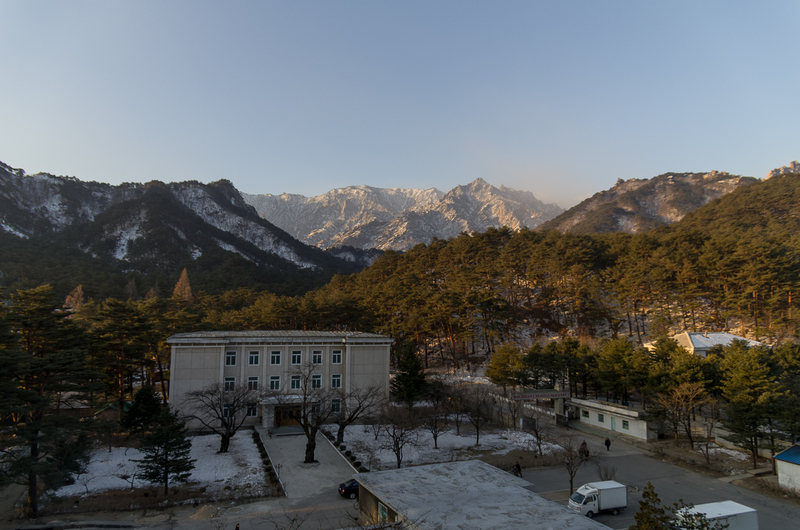 The buildings which tunnel into the surrounding mountains showcase gifts given to Kim Il-sung and Kim Jong-Il. Some gifts include a basketball signed by Michael Jordan from Madeleine Albright and a bulletproof limousine from Joseph Stalin. 9 Hiking at Myohyang-san. Even in the forest it's hard to get away from the propaganda. 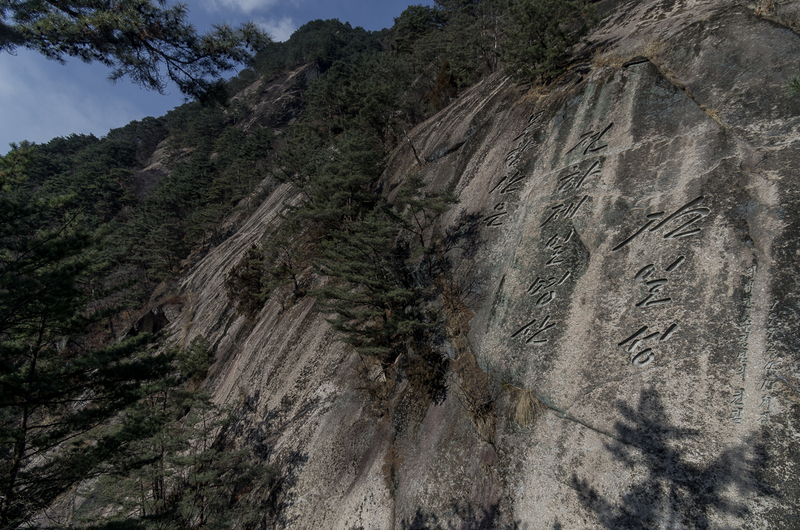 It translates to "Mount Myohyang is the greatest mountain in the whole world. -Kim Il Sung". 10 Street traffic in Wonsan, a port city on the east coast. The bicycle is a popular form of transport. At the time woman were technically banned from riding bikes. 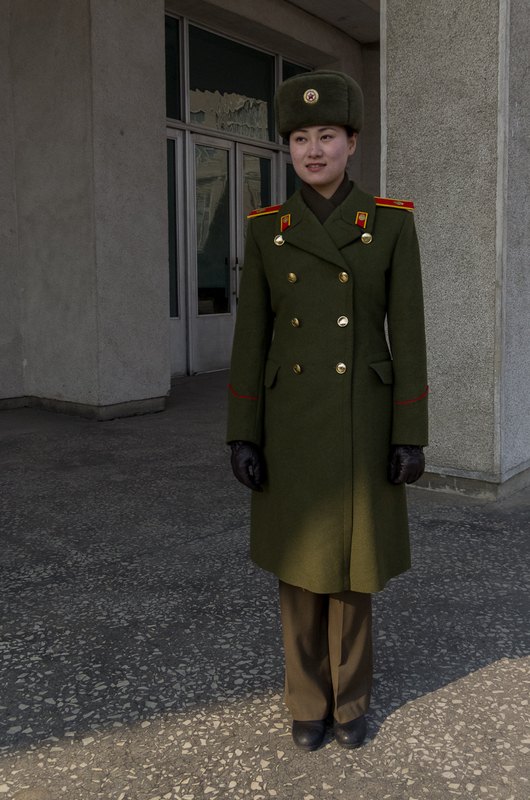 I never saw women riding in Pyongyang, but in Wonsan it was quite common. Recently has a ban has been lifted. 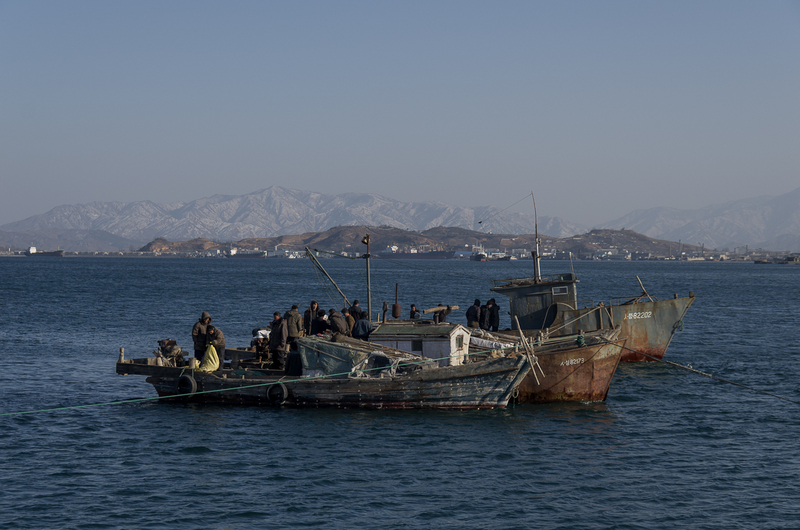 11 Boats in Wonsan harbour. 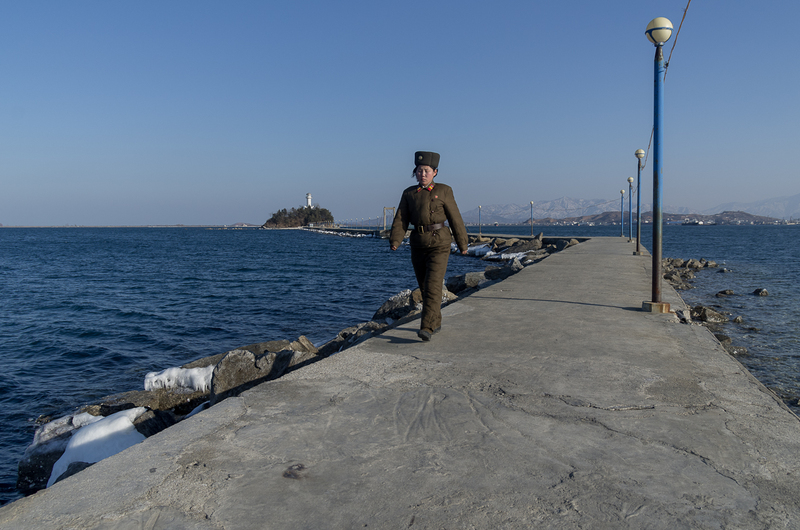 12 A female soldier walks down a jetty in Wonsan. 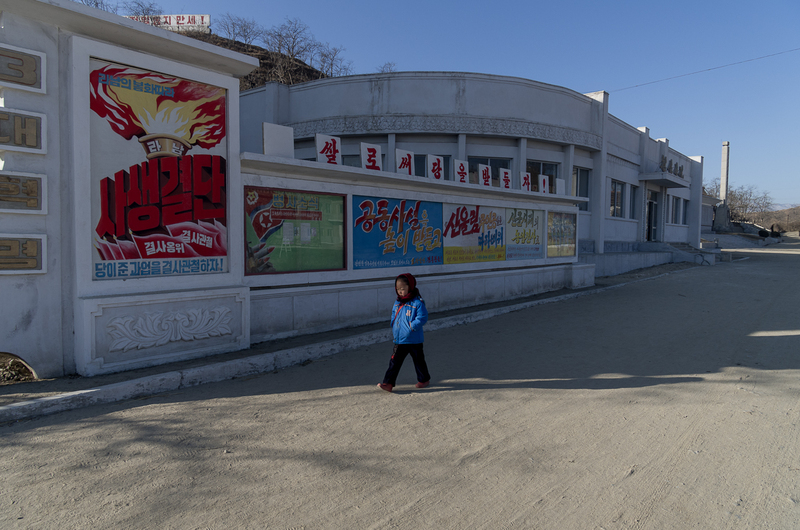 13 A girl walks past propaganda posters at Chonsam cooperative farm. The poster with the torch says "Ties bound in blood. Let us work together to accomplish the tasks given us by the Party." Blue poster: "Let us use public facilities well." The fifth poster "Let us support the Military First Policy." The banner at the top reads "Let us support the land with rice." 14 A view from the Kumgang Mountains from the hotel. The area, developed by Hyundai was very popular with South Korean tourists, with over a million South Korean vistors in 10 years. In 2008 a South Korean tourist wandered into a military area and was shot by North Korean soldiers after she tried to flee. South Korea blocked all travel to the region after the incident. 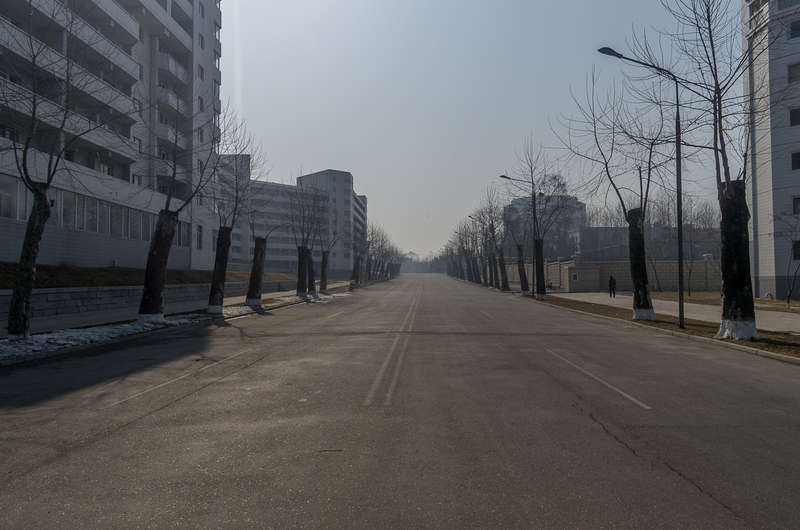 The North Korean government then siezed the South Korean properties. 15 It's easy to see why the Kumgang Mountains were so popular with the South. 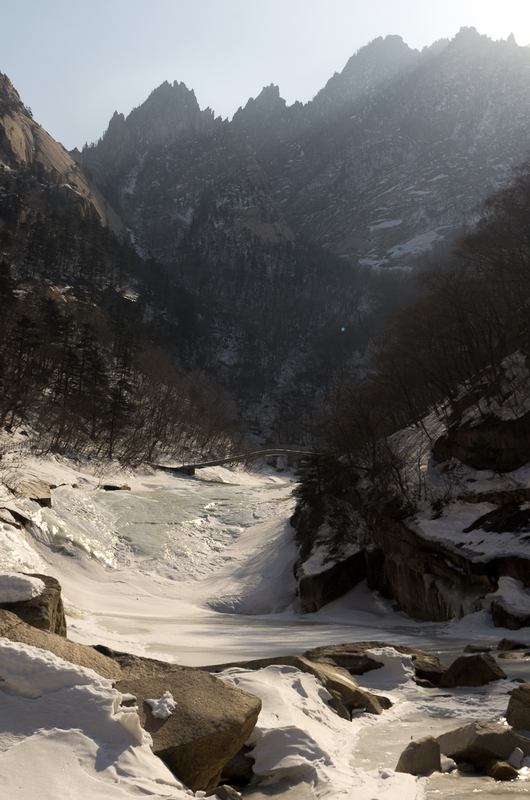 Kŭmgangsan translates to Diamond Mountain and actually has a different name for every season. 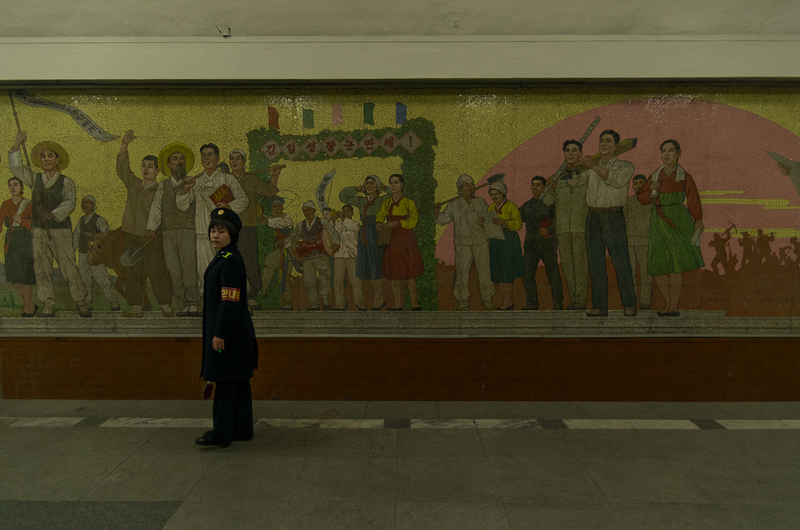 16 A Kim Il-sung mosaic outside of Wonsan. 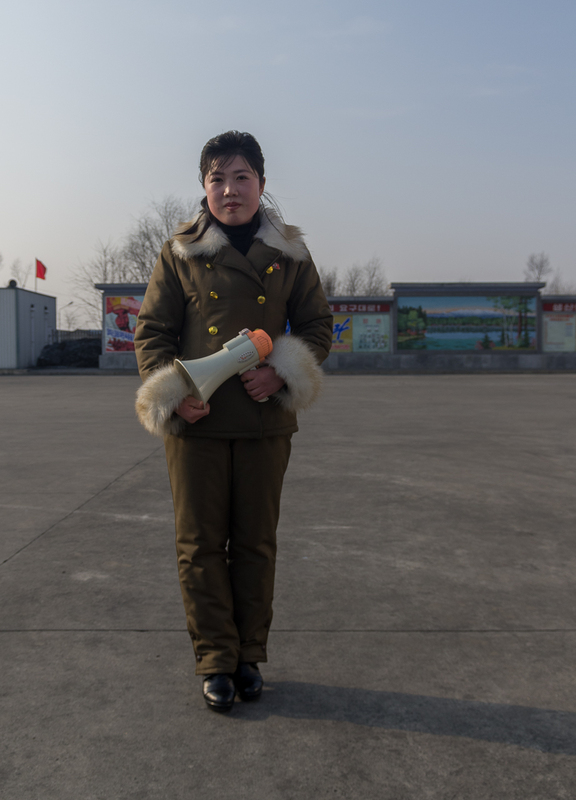 17 Women in Uniform at the Sinpyong Lake rest stop; aproximately half way between Pyongyang and Wonsan. 18 Sinpyong Lake. We kept bugging the guides to let us walk on the ice since its so popular with the locals. They finally let us do so here. 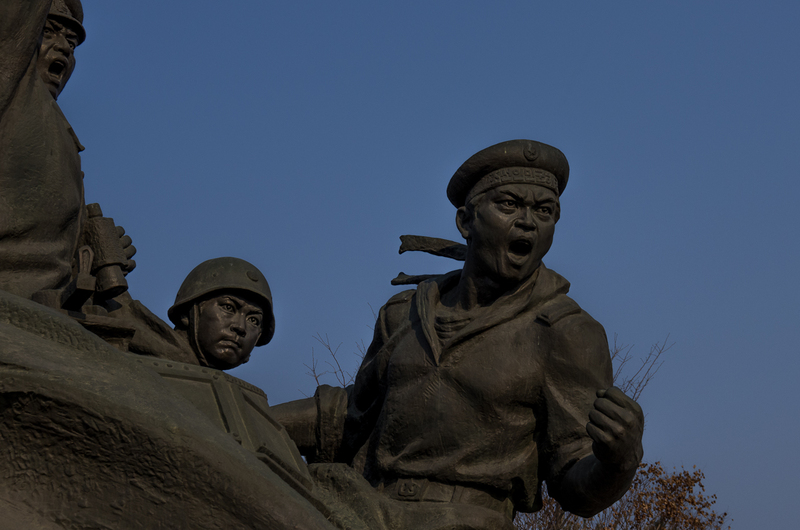 19 Kim Il-sung square is where they feature the big military parades. They use the markings to line up the soldiers. 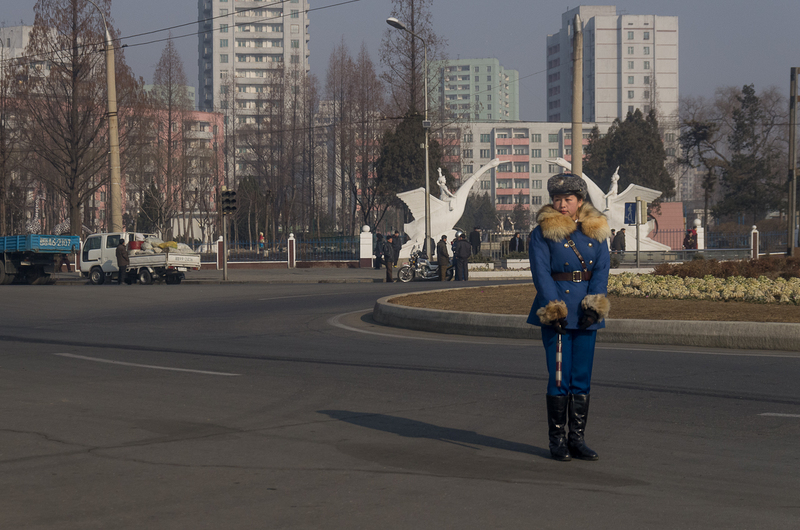 20 Soldiers walk through Kim Il-sung square. 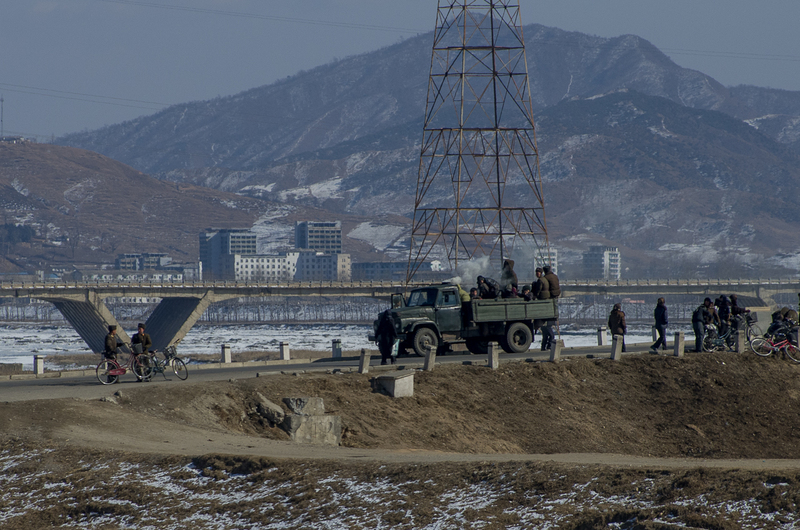 Across the river stands the Juche tower. 21 One of the famous traffic cops in Pyongyang. 22 Kim Il-sung at the Three Revolution Exhibition. This type of monument is very important to the regime with over 500 statues of his likeness scattered throughout the country. 23 Electronics and Industry of Automation and Communication Hall. 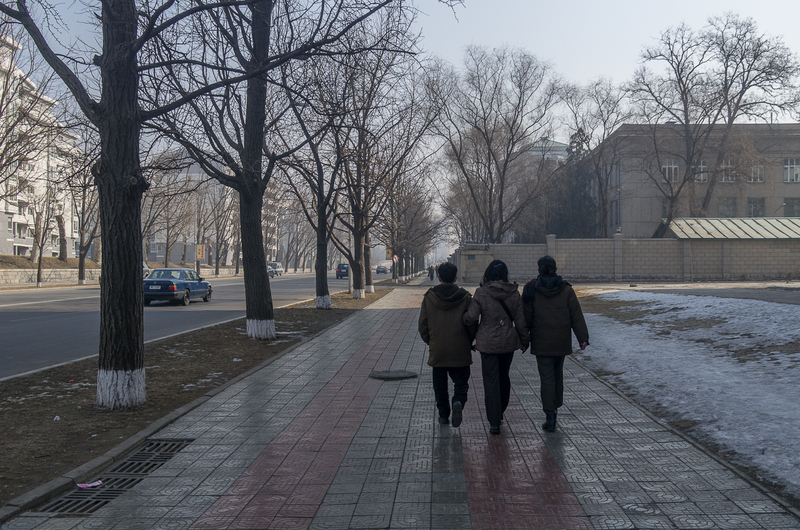 24 A walk down Mansudae Street, Pyongyang. 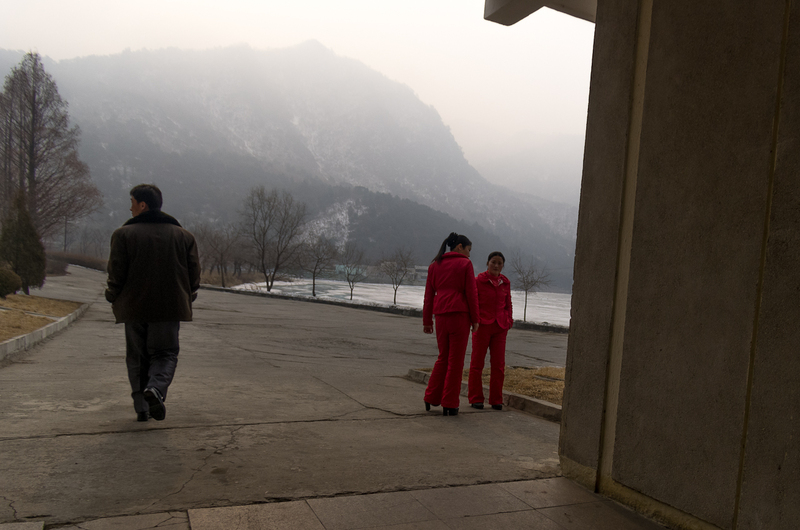 Physical contact is really part of the culture in North Korea; it is not unusual to see two women holding hands. 25 Beautiful trees. It probably looks better in the spring. 26 Hotel staff, part of a choir, peparing to leave for an event. 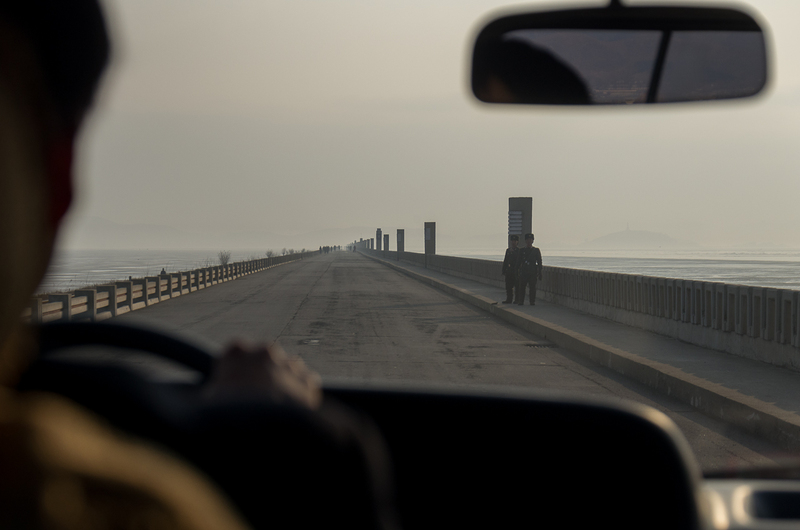 27 Hero Youth Highway from Pyongyang to Nampo, a city on the west coast of the peninsula. 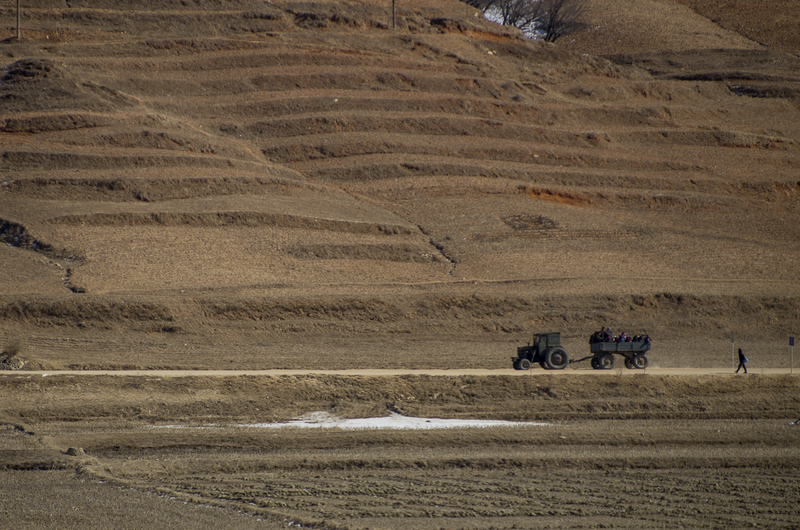 Many of the highways in North Korea are like this, massive, straight and empty, often going straight through mountains. 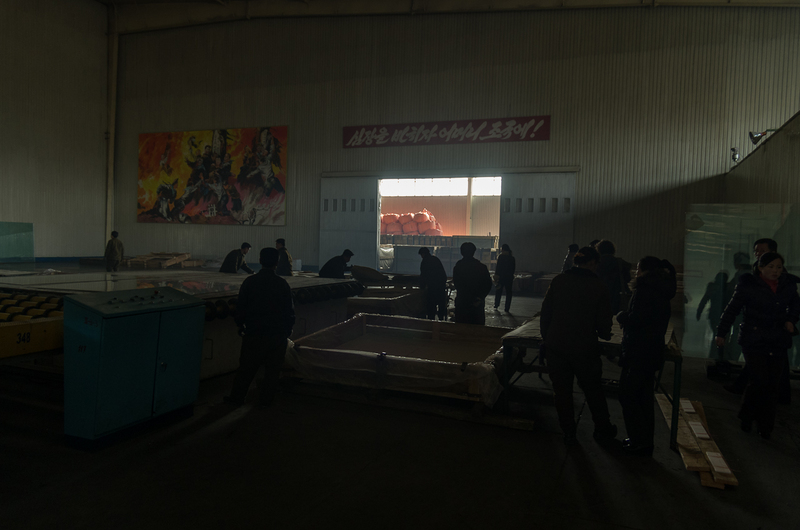 28 Workers collect and pack glass at the Taeían Glass Factory outside of Pyongyang. The factory was built in 2005 with the help of a Chinese investment. The banner says "Our hearts beat for the Motherland." 29 Our local guide at the Taeían Glass Factory. 30 On the West Sea Dam. 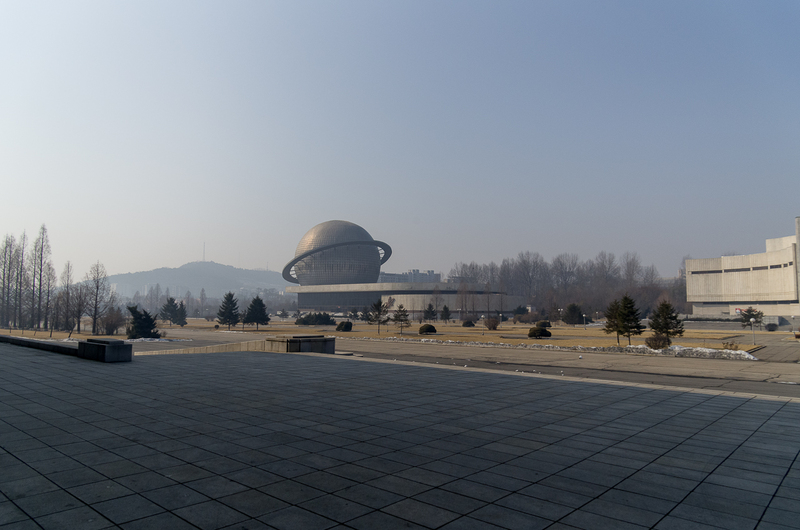 Completed in 1986 it raised the water level of the Taedong River to help with shipping and irrigation. 31 We were shown us a DVD about the construction of the dam here. 32 At the start of the trip I asked the guide if there was anything she wanted to do. She suggested fast food. Great idea! Going in with low expectations, the food was actually pretty good, plus they serve beer! 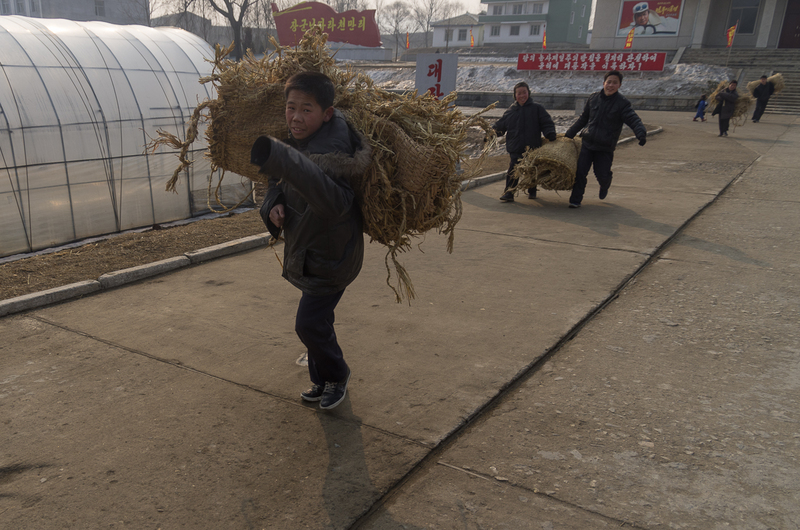 33 Boys carrying woven blankets at Ch'ongsan-ni Cooperative Farm. 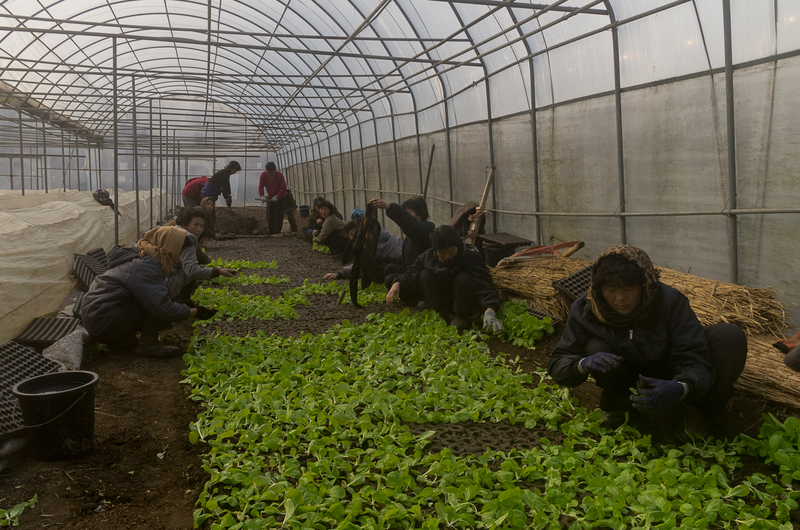 34 Women plant seedlings in a greenhouse at Ch'ongsan-ni Cooperative Farm. 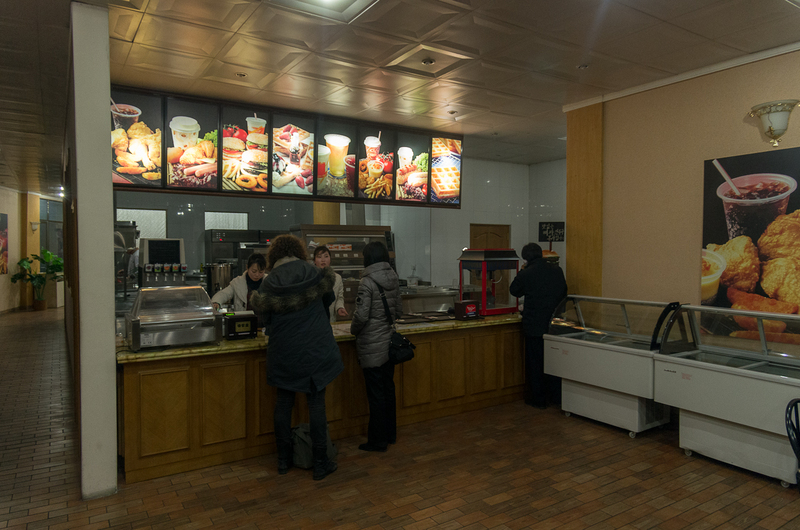 Since North Korea is a Communist, Socialist state, all food production is done by the state. These women are assigned to live and work on the farm. 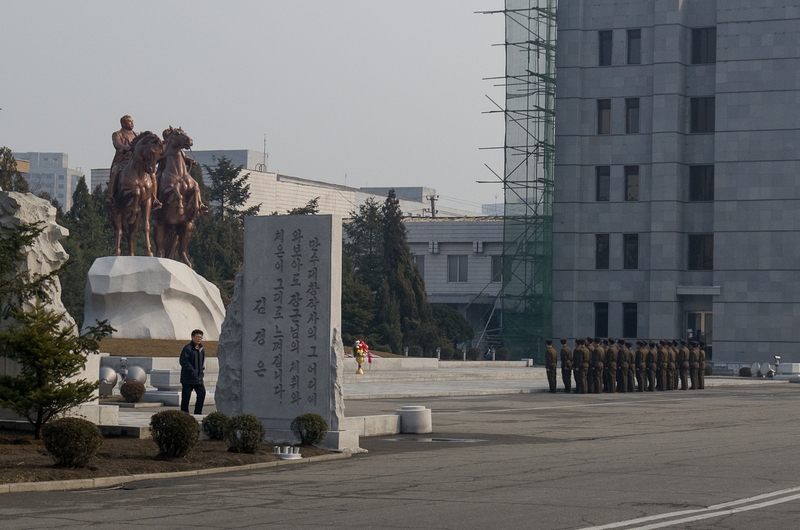 35 Soldiers prepare to bow to a newly unveiled statue for Kim Jong-ils birthday at Mansudae Art Studio. 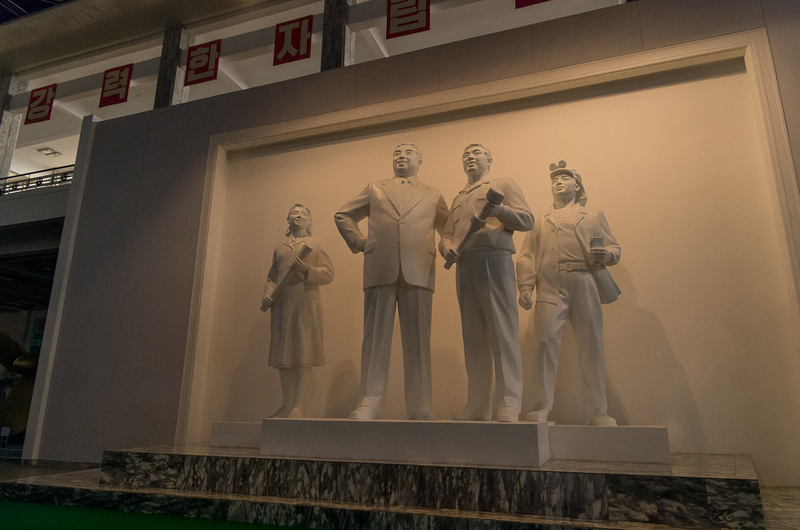 Originally it was just a statue of Kim Il-sung, but now the Kim Jong-il portion has been added. 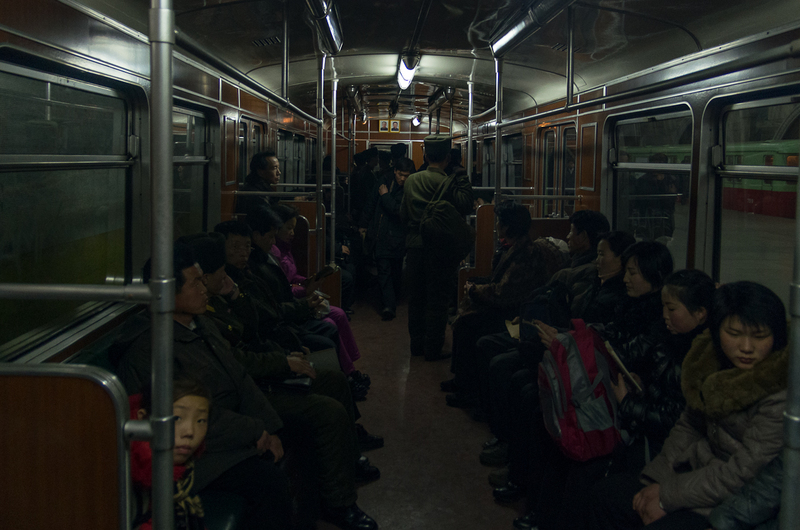 36 A girl peers into the camera on the Pyongyang Metro. 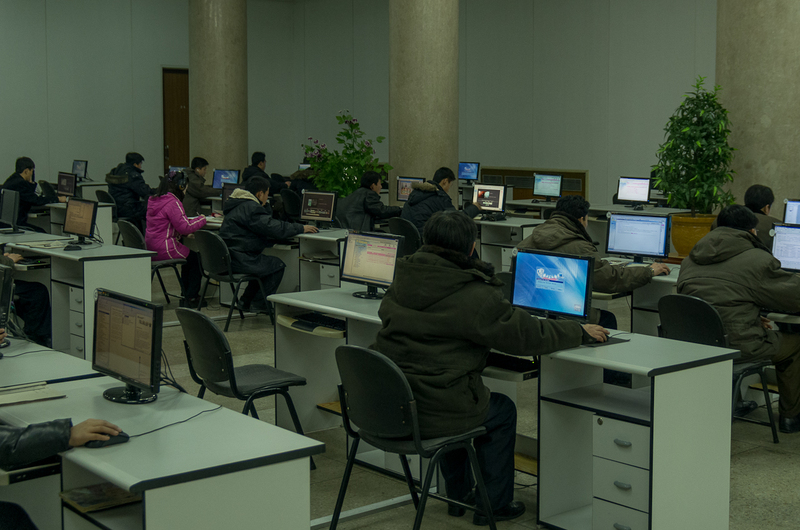 37 Locals read the "Rodong Sinmun", the most widely read newspaper in North Korea. 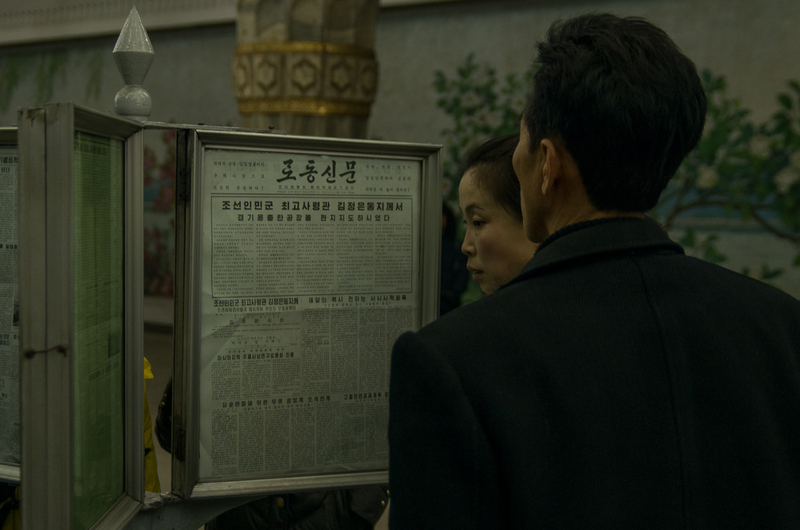 Rodong Sinmun translates to Newspaper of the Workers. 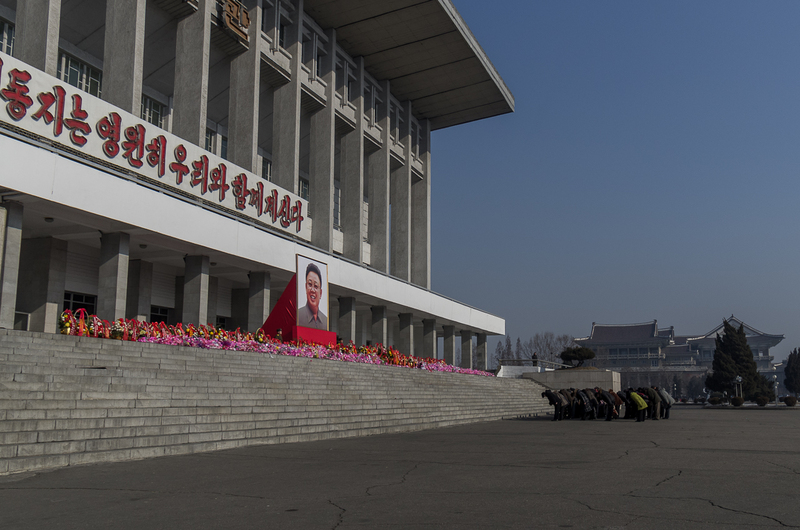 The headline says "A message from the the Leader of the Korean People's Army, Kim Jong-un" with the subheading stating that he toured an armament factory. 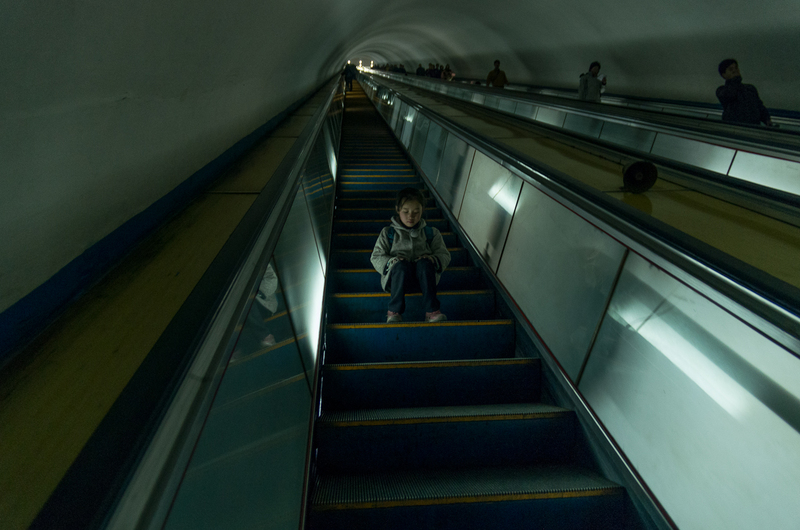 39 A girl sits on the escalator at the Pyongyang metro. 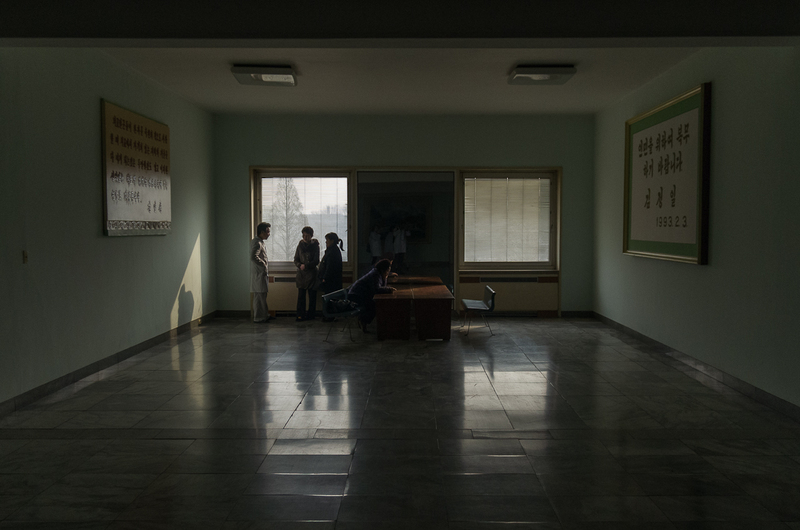 It's common to see children on their own in North Korea. 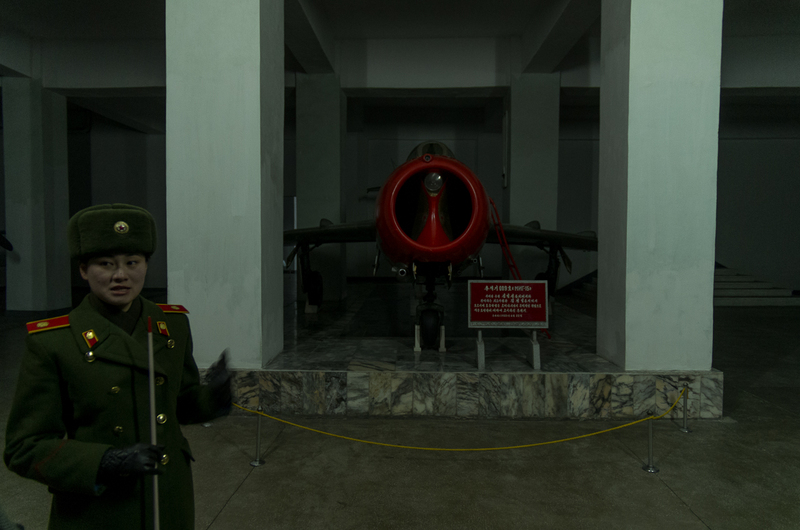 40 Mikoyan-Gurevich MiG-15 at the war museum in Pyongyang. They weren't getting much electricity so the lighting was pretty dark. 41 Our guide at the war museum. 42 Monument to the Victorious Fatherland Liberation War. 43 The Ryugyong Hotel. 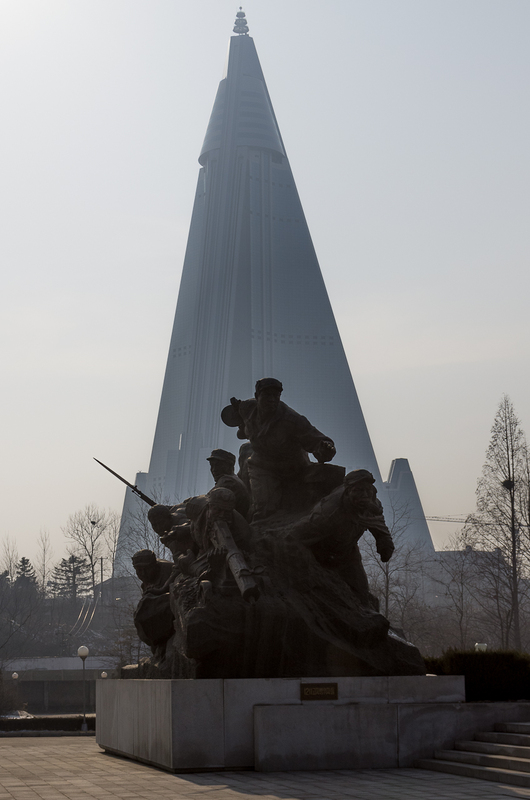 The Ryugyong has a rocky history with construction beginning in 1987 and to be completed in 1989. Construction stopped in 1992 with the collapse of the Soviet Union. The building stood as a concrete hulk until 2008 when construction was resumed by an Egyptian company. 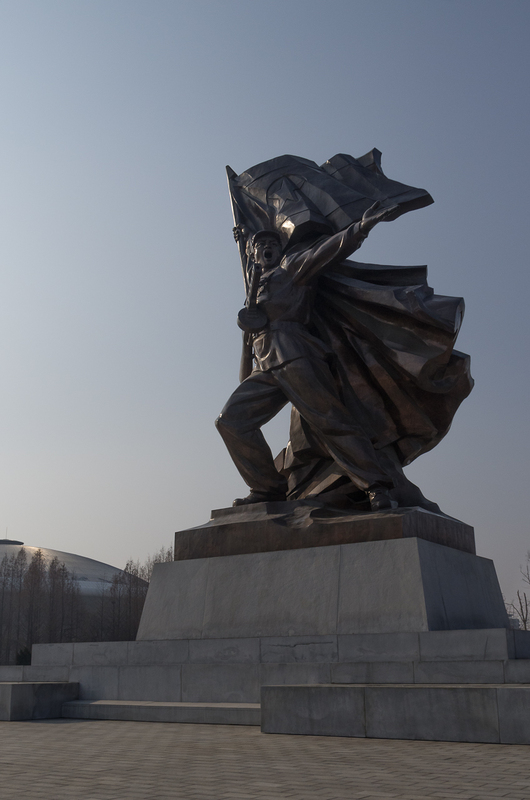 44 The Mansudae Art Studio is behind all the monuments you see in North Korea. They also do work for other countries. 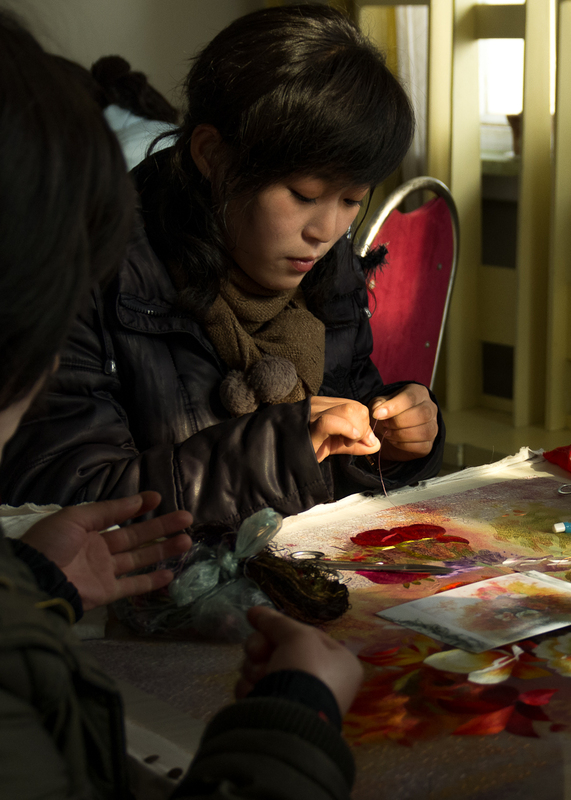 45 Pyongyang Embroidery Institute. The room really felt alive walking into it. All the girls were talking to each other quietly. 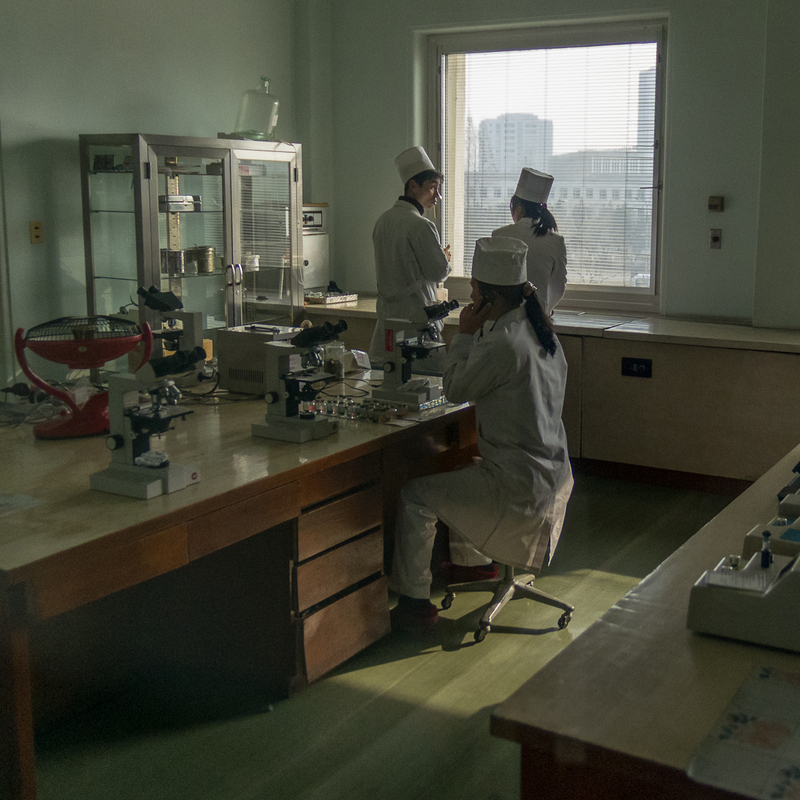 46 At the Pyongyang Maternity Hospital. 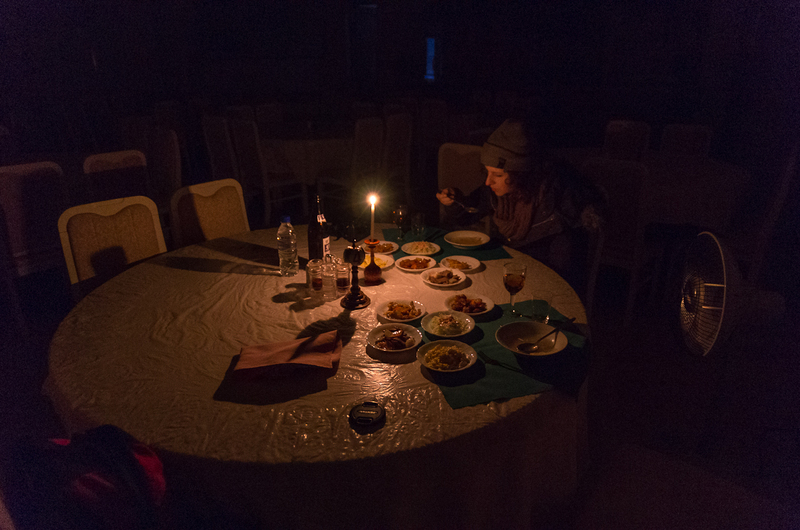 The power went off soon after we entered. According to other tourists even when the power is on the equipment is still switched off the these scenes are setup for the tourists. 48 Upper lobby at the maternity hospital. 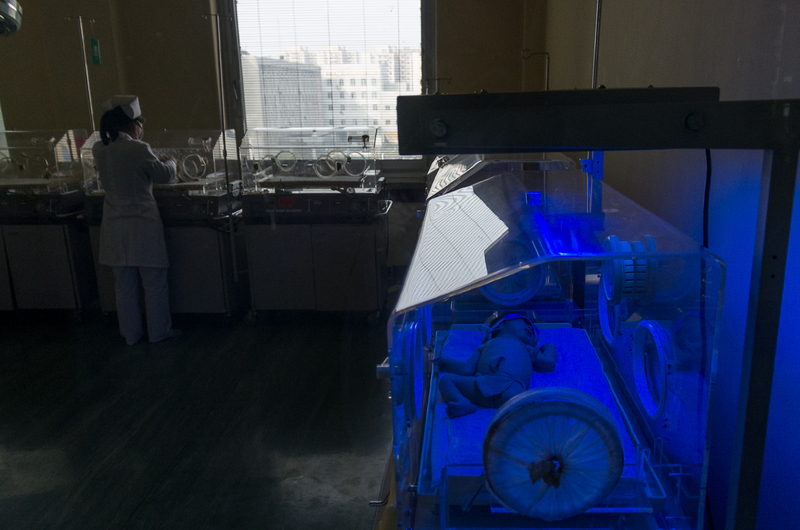 49 A baby lies in an incubator at the Pyongyang Maternity Hospital. 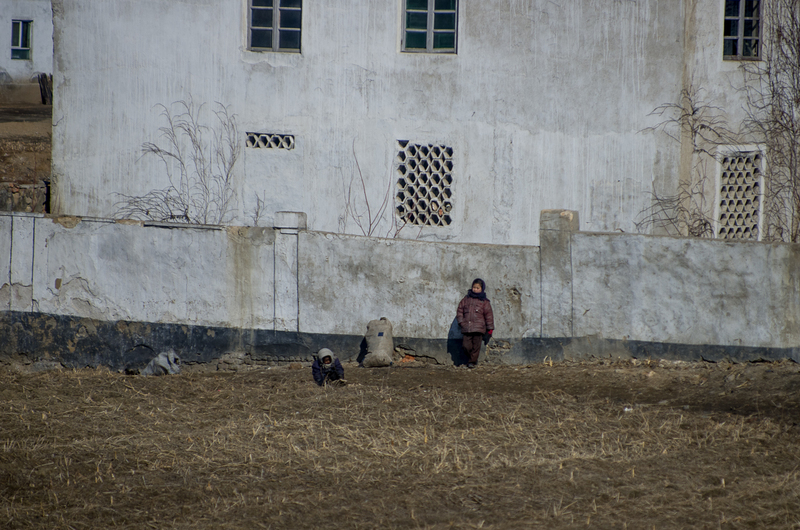 According to the CIA factbook, 20 percent of children under the age of 5 in North Korea are underweight. For comparison, this number is 1.3 percent in America, 3.9 percent in Cuba and 33 percent in Afghanistan. 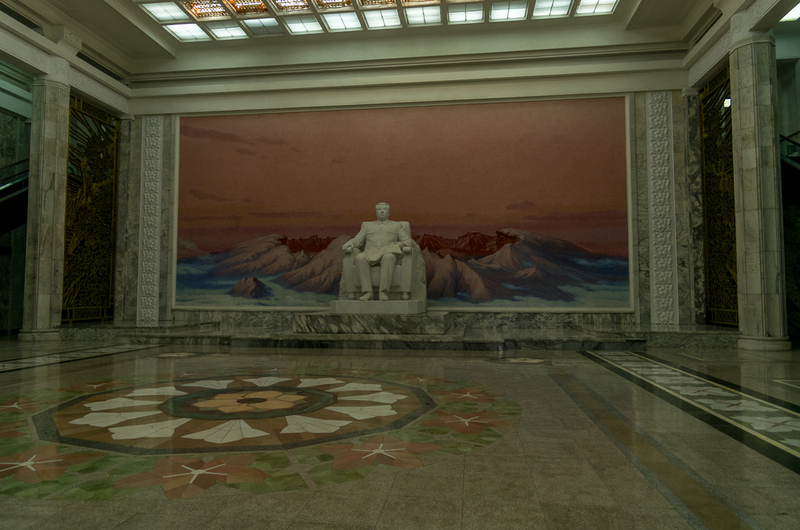 50 Statue of Kim Il-sung at the Grand People's Study House in Pyongyang. 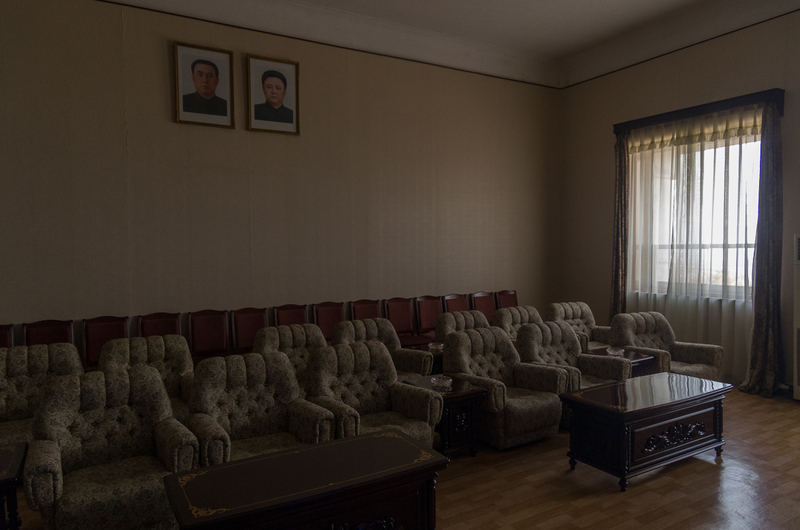 The library includes writings by Kim Il-sung and Kim Jong-il. 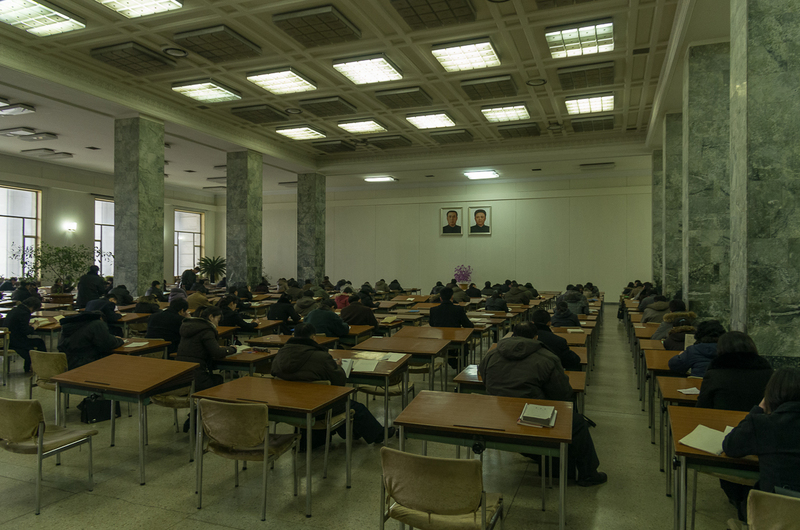 51 Students study at the Grand People's Study House. 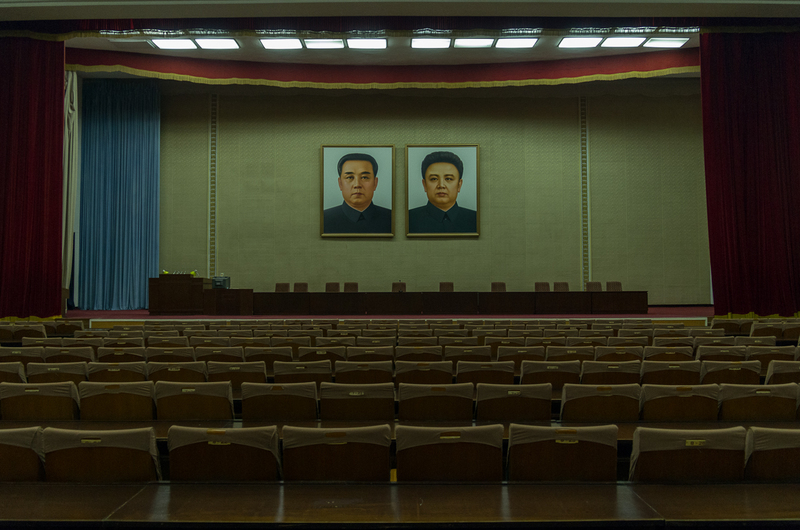 The portraits of Kim Il-sung and Kim Jong-il are common in North Korea and can be found in most buildings, including homes. 52 Computers at the Grand People's Study house where people can look up digitized books and read them. We searched for "Guns, Germs, and Steel". It wasn't in the system. 53 Lecture hall at the Grand People's Study House. 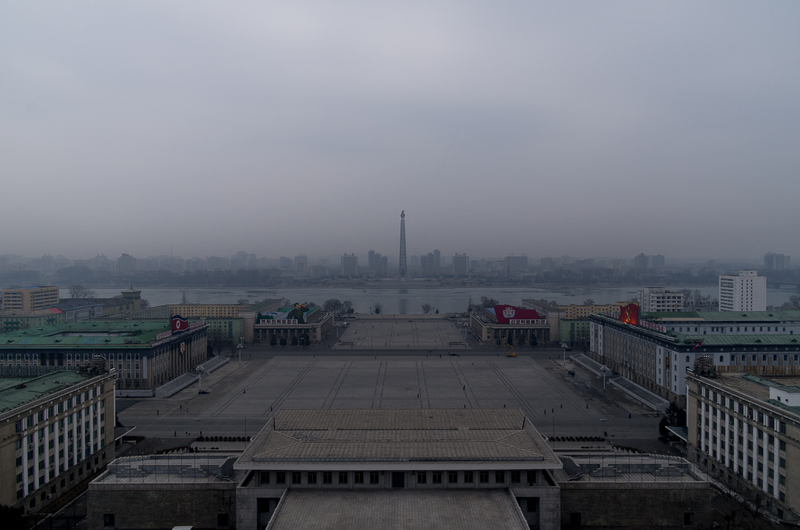 54 Juche tower and Kim Il-sung square as seen from the Grand Peopleís Study House in Pyongyang. 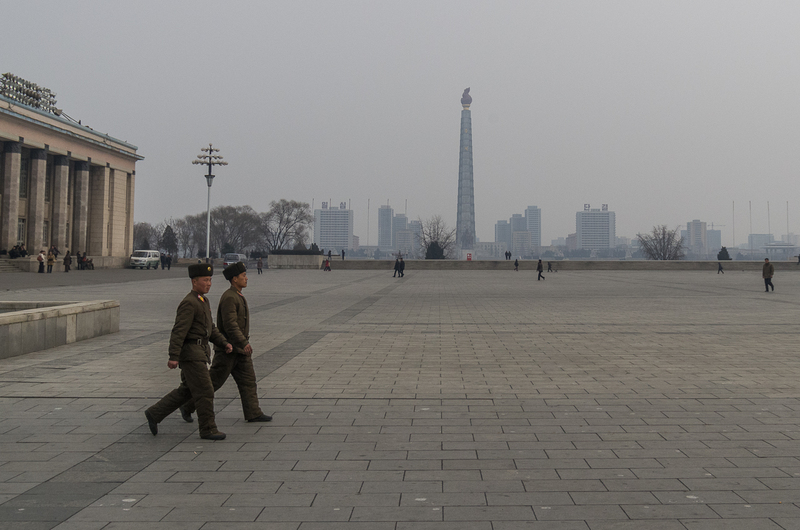 The building at the bottom of the frame is where Kim Il-sung, Kim Jong-il and Kim Jong-un have stood to view military parades that come through the square. 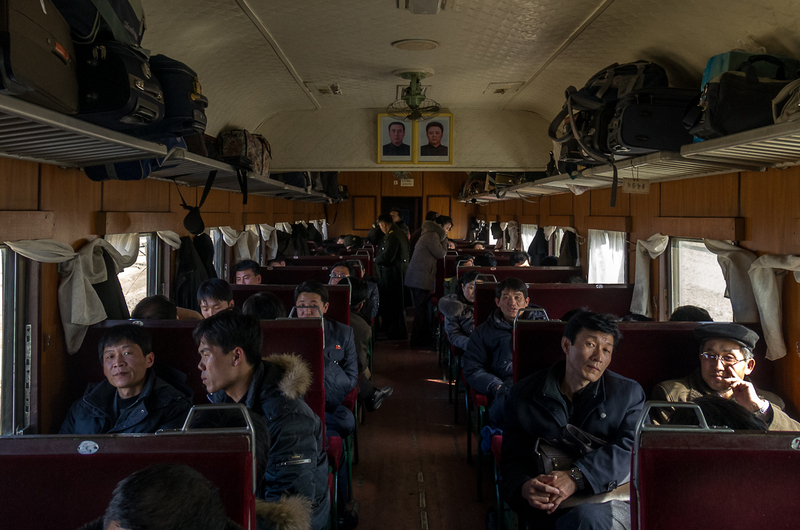 55 On the train out of Pyongyang. This is a really interesting trip because you see Korea a little more uncensored than usual and since the guides aren't there you can take photos. 56 Soldiers make breakfast for themselves. 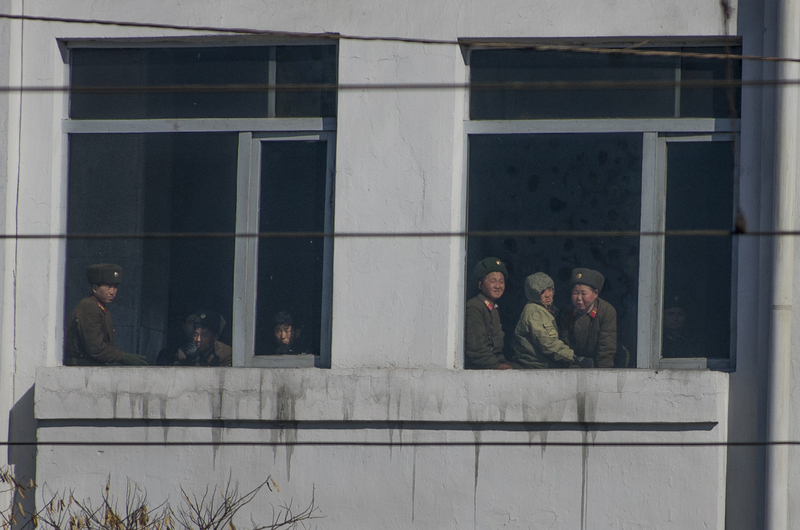 North Korea the largest army in the world per capita at 1.1 million active soldiers and 8.2 million in the reserves. This means 47 percent of the population is either active military or in the reserves. In America, the number is 1.4 percent. 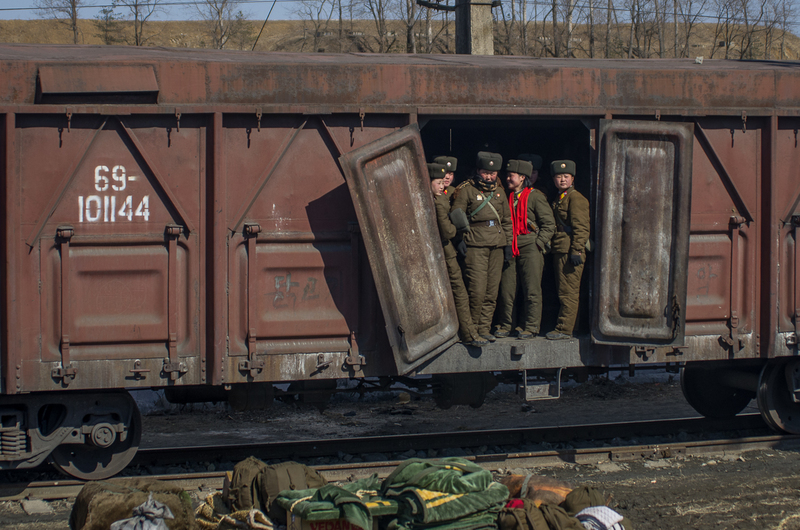 57 Female soldiers stand in a train car outside of Pyongyang. 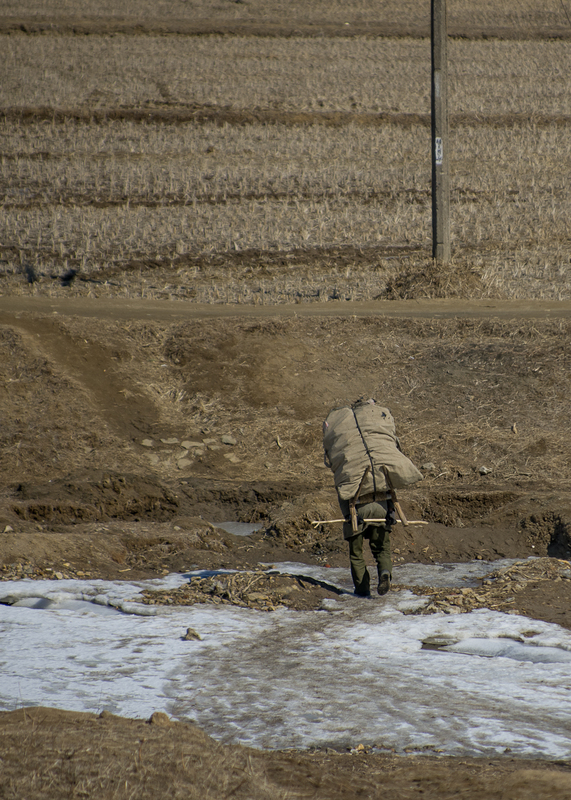 60 A woman walks through the North Korean countryside in February 2012. 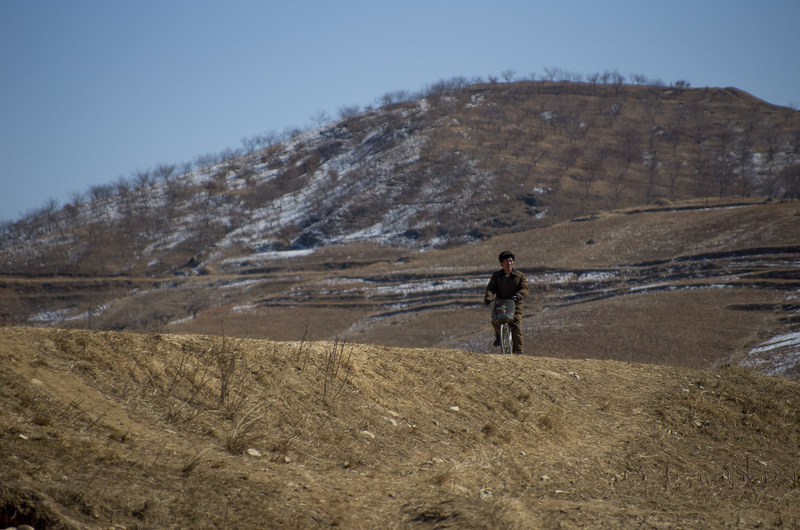 North Korea is a very mountainous country with only 14% of the land being used for farming. The country has trouble feeding its people and relies on food aid from other countries. 61 Chilren in the country side. 62 I didn't realise it when I took the photo, but something cleary happened out of frame that I missed. Judging by their reactions, its probably good that I missed it. 64 Children check out the train. 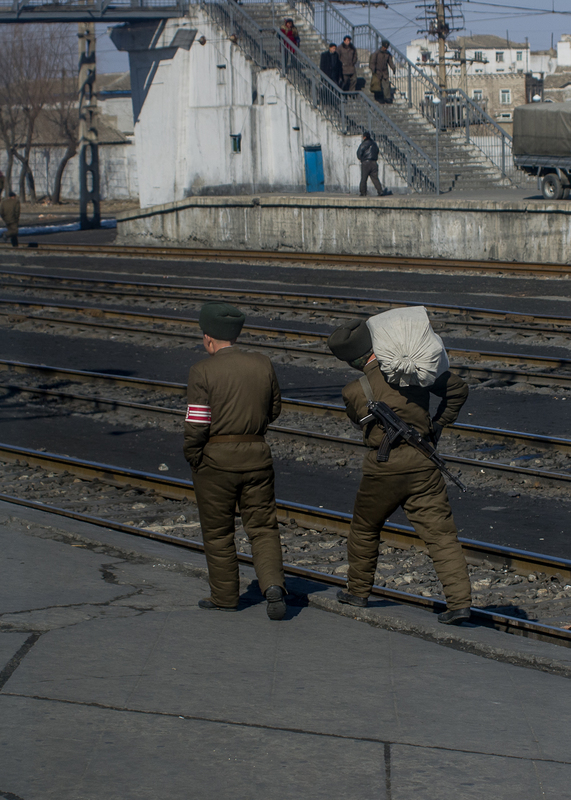 65 The North Koreans manufacture their own version of the AK47 for use in the military but they also are exported. 66 A wood gas powered truck. Since fuel is an issue, many of these trucks have been converted to run on wood gas. There is a furnace in the back which burns a fuel like wood, or corn husks. The gas produced from this is then used as a fuel in the engine. These trucks did not appear to be very reliable. 67 Anybody traveling outside of Korea occupies the modern Chinese cars. 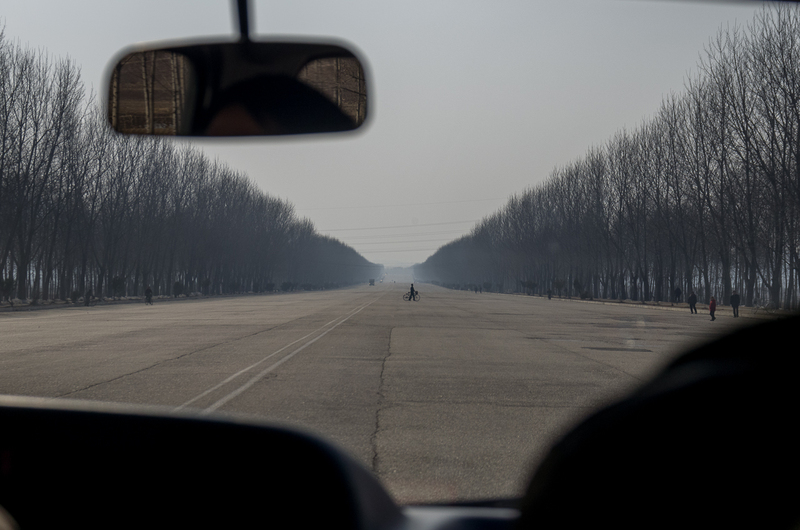 Here North Koreans ride in the old soviet cars. I suspect these are relatively nice cars compared to the rest of the train. When I tried to continue past the dinner car the waitress stopped me. 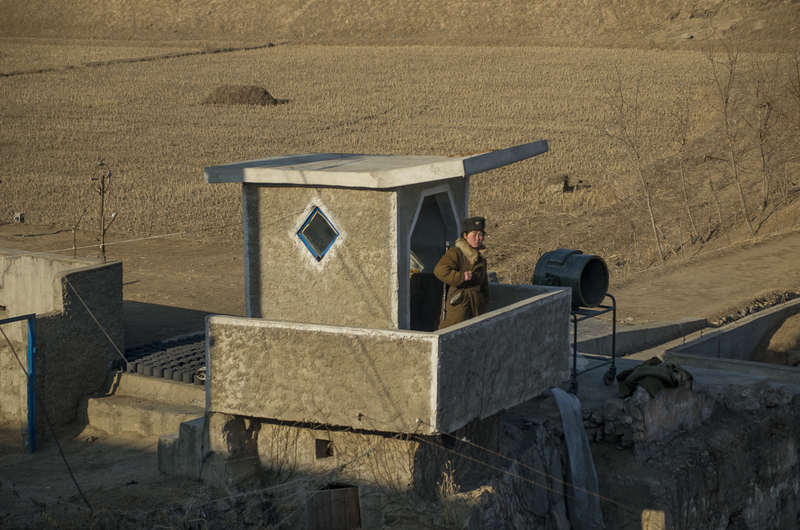 68 A solider keeps watch. They seemed to have these huts at the entrances and exits of tunnels, I'm unsure of the reasoning. 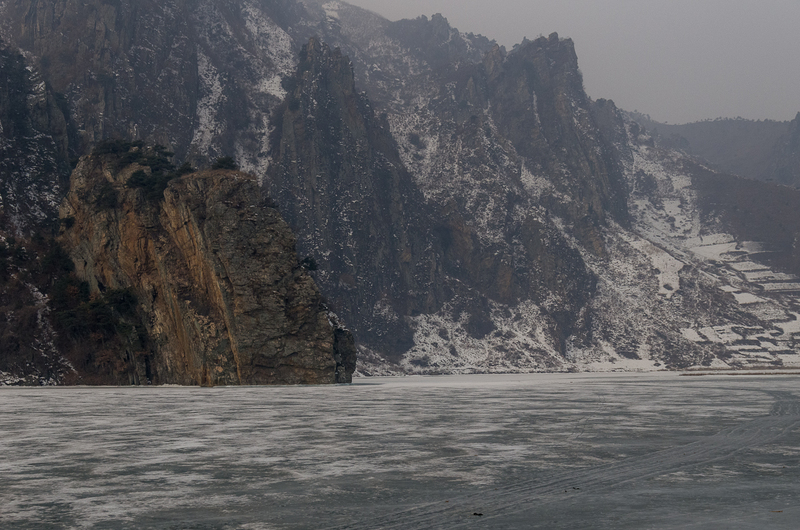 69 The Yalu river divides China and North Korea. 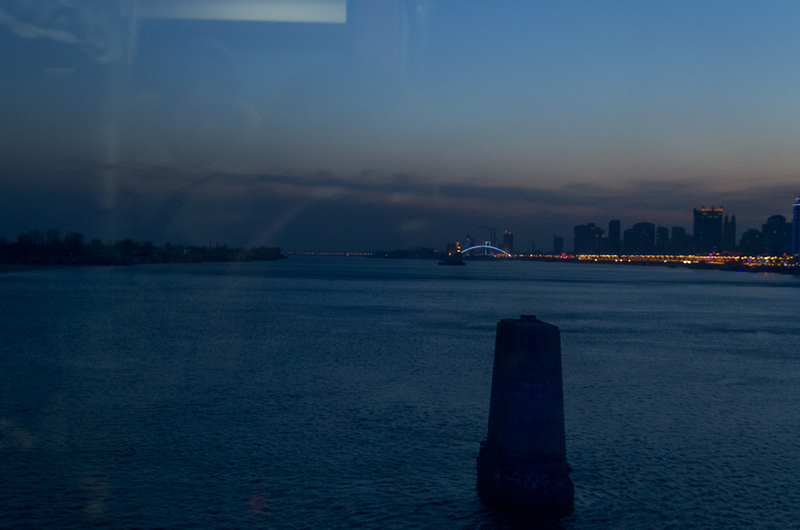 The bright lights of Dandong, China on the right, and Sinuiju, North Korea on the left.